Anxiety and depression often go hand-in-hand, and many people who suffer from one of the conditions also suffer from the other. Because they seem to be caused from the same sources, often hormonal imbalances, there is an inextricable cause and effect link between them; depression has been known to cause anxiety and vice versa. This means that many of the signs and symptoms are the same for both conditions. Read on to discover more about which anxiety signs are linked to depression. Depression is a feeling of long-term sadness, and this can often have no obvious cause. Although all people will have periods of feeling low in their lives, clinical depression means that the negativity does not dissipate without intervention, often medical. 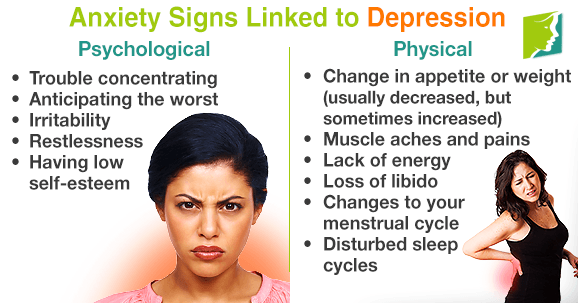 Women seem to be more at risk of developing depression than men, and this is often attributed to the fact that women tend to experience more hormonal imbalances. However, it could also be because men are less likely to seek help for depression owing to societal pressures. Anxiety is similar to depression, usually arising from the same sources, but instead of feeling sadness, the sufferer feels a constant sense of fear or dread. This can be connected to certain triggers, such as social situations or heights, but can often be due to no apparent reason. The social withdrawal or intense fear that is a typical consequence of anxiety can often bring about depression. The fact that anxiety and depression are so closely related is a both a curse and a blessing; on the one hand, sufferers might have to deal with two distressing conditions, but, on the other, the methods of dealing with them are often the same. For anybody wanting to rid themselves of either or both of these illnesses, it is often recommended to try self-help remedies first, such as getting more exercise and altering your diet, as this is cheaper, healthier, and more sustainable than conventional medical interventions. There is an inexplicable connection between anxiety and depression, and one will often cause the other. Although they are very distressing and it can often feel an insurmountable task to cure them, they can be treated, so it is important to talk to your doctor as soon as you begin to see the first signs. Read complete information about anxiety or about depression.